I sat down with Tina Fleecs at The Well last week. I had five questions ready for her about the experience of moving from the sprint distance triathlon to the Olympic distance and now to the half ironman. 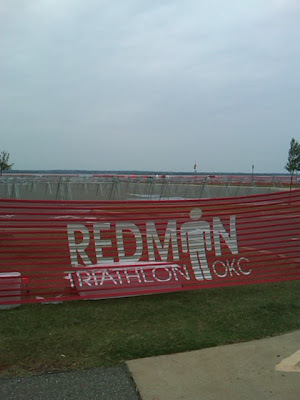 She was in her black finisher shirt from the Redman Triathlon in Oklahoma City. "Great shirt," I say. "Yeah," she says, "I've been wearing it every day." The five questions go out the window. I have to hear what kind of experience gets you to wear a shirt four days in a row. We drink pumpkin ale, and she tells me. Here's Tina's race report, in a sense. I rewrote this in present tense because I am not a masterful enough writer to convey the excitement in her voice otherwise. And as her friends would likely point out, in real life, she can and does speak in full sentences. Into town late Thursday night, sleeping in Friday. To the lake: transition, hey, everything's fully set up a day before the race, the Ultramax red fencing all around and lining the chute. My transition space: marked with a sticker! Name: Tina Fleecs. My race number. 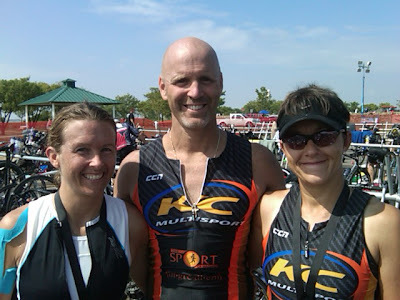 KCMultisport. Cool. Let's check out the water. 73, 74 degrees. Then lunch and bike check-in. You hand over your bike, and there's tons of security around the bikes here. For a big race like this, you take care of the bike the day before. Especially good if you're from out of town. There's so much going on race morning that the last thing you want to worry about is your bike. You know, checking it in is fine, but later... after doing things in a certain way, and you have your routine, when you take out a big piece like that, it's weird. Night. Laying out all my stuff. Tomorrow I'll throw it in the bag. Especially coming from out of town, it helps reduce the anxiety to see all the stuff ready to go. First departure from routine: in the morning, painting my toenails. Usually I do that the night before. My friends: "Did you seriously paint your toenails this morning?" Me: "Well, YEAH. I didn't do it last night." Feeling great. I'd gotten some rest. Beds at this hotel soooo comfortable. Getting ready. The usual stuff. I'm... excited, but not nervous. Surprised at this. In and body marked. Setting up transition area. Still not nervous. Surprisingly. Decide not to warm up. For a race this long — it's kind of like how I feel about running half marathons — you're going to be running two hours. You have plenty of time to warm up. Wha? It's raining. Just a drizzle. Light rain, that's all. Put my wetsuit on to stay warm. The rain is picking up a little bit. People are handing out trash bags in transition, to cover the stuff. iPod, phone are in a plastic bag. OK. Start tweeting. I'm tweeting all morning. Still feeling yadda, yadda, really. Pre-race activities starting by the water. Grab swim cap and goggles. They tell us there's a portion of the bike course where we'd have to get off and walk around because the water was six to eight inches deep on the road. That's because it rained in Oklahoma City last week. The whole area is a muddy, red mess. And the rain's picking up. Every few minutes, picking up a little more, a little more, and now it's really raining. We're standing in staging. All of us are pretty miserable. And my wetsuit's a shorty. Announcement: The race may potentially change to a swim/run. NO WAY. My friends and I all look at each other. NO WAY. I mean... you take any piece out... it's just not the same. I mean, a better song couldn't have been played. The energy is incredible. Everybody feeling great now. A perfect, perfect song. Eight AM. Full distance is starting. 200, 220 people doing the full distance. Fifteen minutes later, the first of five waves of the half distance. They also have an aquabike at this race, where they take out the run portion. I'm in the third heat. A little worried about not warming up. I know I'm not a fast swimmer. 8:30. The gun goes off. Pink caps out in the water, BOOM, and it's like BATH WATER. So warm! And shallow! It's waist-high! So I walk and keep walking. My friend is swimming next to me, and I'm staying right next to her, walking. Then swim quite a ways, then side stroke to see what's going on. I can STILL TOUCH. The course runs parallel to shore. I thought I'd get nervous seeing the buoys — it's 1.2 miles, and the buoys just goooooooo. But I get going. Hit the first big buoy. Feeling awesome! Just keep chugging along. Getting toward home stretch. At the last big buoy, you see this big red bull balloon. 3/4 of the way done. Look at my watch. 31 minutes. Hoe. Lee. Smokes! Start pouring it on! There's the red bull. Going as fast as I can now — I know I'm going the right direction, so no sighting. Fingernails are scraping concrete. And tons of volunteers are there! Cheering, and gals out in the water helping you unzip the wetsuit. Run out. And then. The WETSUIT STRIPPERS. These women! They yell SIT DOWN! One on each side, they just get ahold of the wetsuit with both hands and pull! and jwwooooop, it's off! Wow. The wetsuit strippers. And off you go. Look down at my watch. 48 minutes. I'm like, Ho, ly, crap. Can't believe it. Drying off. Shoes. Helmet. Stash nutritionals. Tweet: 48 minutes! Drink of water. Grab the bike and off I go. Before the race, had worried about getting cold on the bike. In transition feeling great, so — screw it, I'll be fine. And it's perfect. 3 mile jaunt around the north side of the lake and then city streets. Around mile 6, dismount. Water has to be a foot deep. Run around, back on. Goal: average 17 or 18. Don't want to get over 18. If I push, probably will crack on the run. "I didn't have any expectations. As with any other first race, you just want to finish. I just wanted to get out there and do what I've been training for. The biggest thing was pacing on the bike. I didn't want to be impetuous on the bike and then crack on the run. "I know there's no shame in walking. But you know... I'm not out there to walk. I didn't run all those miles, all that effort, all that sweat, for nothing. That's why you've got to take it easy on the bike. I averaged 17.7 on the bike." But feeling good, at times around 23, 24. Kind of letting my legs go. Feeling great. Rolling hills. No big elevation changes. Cruising right along. North 10 or 11 miles, a left hand turn. Around 14 miles the roads kind of crappy. Lots of potholes. Can't put the bike on autocruise. Have to pay attention. Out and back. Halfway point: 1:35. WOW. Remembering now. When I was setting goals, thinking 3 hours on the bike. Then thinking, scale it back. You're crazy if you think you're going to do a 3 hour bike. So I said, OK, 3:30. Turn, get going again. Catching some friends, so that's kind of cool. Consistent with nutritionals. Very happy with the bike. "Those people down there take a lot of pride in this race. On the bike, at every intersection for 28 miles, there were one or two volunteers. At major intersections, uniformed officers. But on every T-boned side street, one or two volunteers. Out in the country, volunteers at every little country road. Unbelievable. The support! Unbelievable support. And this race is only in its 5th year." Around the north side of lake and not doing my usual dismount. I normally come out of the shoes. Don't want to fall over. Hop off and walk in. Look up. And there's mom and dad. I told them it wasn't like my other races where they'd be watching for one or two hours. You'll be watching for six hours. And here they are. They get a pic of me smiling. Can't help smiling when I see my mom and dad. "After watching the race, Dad says we're nutters. The ones who did the half distance: nutters. The full distance: supernutters." In transition. Everything SOAKED. Towels. Shoes. Socks. OK, screw it, no socks. Put on shoes, visor, belt, Grab nutritionals. Another tweak to routine. I stop for the restroom. Well, I could pee down my leg. I have a friend who's had to do that. But look, I can barely pee in the river, let alone down my leg in a race. Come out, switch modes on the watch. Negative split on the bike. Second half 1:32. Huh. That's pretty cool. Get my stuff together on the run. Some fun, being wet. And covered in mud from the bike. My poor bike shoes were white. From the moment I start running, this feels awesome. Cruising at an 8:30 pace. It's fairly fast. Wasn't expecting to run an 8:30. It's an out and back that you run twice. Out and back. Out and back. Feeling great. Running through puddles, running through mud, seeing tons of people from Kansas City. Look at my watch. 8:30, 8:40 pace. Going back. Still smiling. First half in 56 minutes. Tons of people cheering, which is awesome. Cheering for me. Huh? I love how they put the names on the bibs! Random people cheering for you. First time it happens, Go Tina! I have to turn around. Who's cheering for me? I am still just in awe that I ran a 56 minute 10K. "It's quite a big jump from olympic to half. The training runs were lots of long distances and lots of 10Ks. I was just looking to survive. Occasionally I need to pace on the run, but here, after the first 6 miles, I felt awesome, so I let my body go. You have to listen to your body. If it's screaming, don't push it. If it's saying LET'S GO LET'S GO, then pour it on. That's what you put all those hours in for, to test your limits." Head out, last lap, doing my gel. Grab an orange. Shoes start rubbing. That's going to blister. Whenever I have a chance, step in a puddle. Slow down a little. 9 minute pace. Feels great. Totally fine. Still seeing tons of KC people. Last turn: 3 miles left. Passing quite a few people. Cruising! Feeling great! At the 13 mile sign, there's the chute. You see that sign, and you turn it ON. 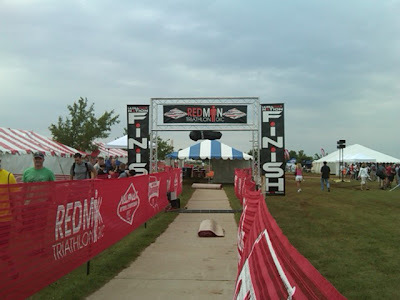 The Redman banner lines both sides of the chute, and it's just pulling you in, red all the way to the finish! Clock says 6:18. I have an inkling I'm under 6. My initial goal was 6:30. I have a tendency to set really high goals, then reassess. Think, that's not really realistic. So when I was setting goals, I started breaking it down: 1:10 swim. 3:30 bike. 2:30 run. Sub-7, I'm cool. At the finish. Finished. It feels... amazing. I kind of stop. Bend over. Just want to absorb it. What's going on here. Am amazing experience. My friend waiting for me at the finish. Then, on through. And tons of food, gatorade, water, tons of fruit. went to the bathroom, I guess." Official splits: Swim, 47:35; Bike, 3:07:21; Run, 1:56:17. I guess you could say the training paid off. My coach calls me. I keep the message. She is just going crazy. I LOVE YOU. YOU DID AWESOME! Ann says: To hear when someone's worked so hard, then has such a fantastic experience, is a huge boost of energy to anyone who hears about it. As the WinforKC tri coach this year, Tina gave a whole crop of new triathletes that boost of energy; it's tremendous to hear how great her first half ironman experience was for her. She's still wearing her Redman wristband. "I don't know when I'll take it off," she says. "Maybe when I take off the finisher shirt." Great job, Tina...it was quite the experience!! Great story. I am so happy for you! Amazing stuff. It was great to read about your experience. It seems like the weather didn't even phase you--you went out there and beat your goals! You are awesome, Tina! Thanks for sharing your story. You are an inspiration! Wooooooo Hooooooooo! I love it! Thanks for sharing the details! Very Inspiring. Awesome. Just awesome. I totally needed that kick in the pants! Sign me up for next year's race!! Thanks for sharing this Tina. I could hear your voice in her writing! It absolutely rocks that you did it UNDER your goal. Way to go, girlfriend! So happy for you!!! This is awesome. To surpass your goals must have felt just incredible. So very happy and excited for you Tina. You helped and inspired so many of us. No one deserves a fabulous experience like this more than you. CONGRATULATIONS!